. Yoshinoyama - 吉野山 Yoshino Mountains - . Zenki was born in 奈良県吉野郡下北山村 Shimokitayama village in Yoshino. 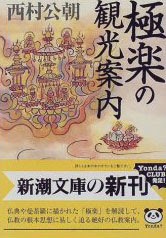 - - 前鬼の里 Zenki no Sato. 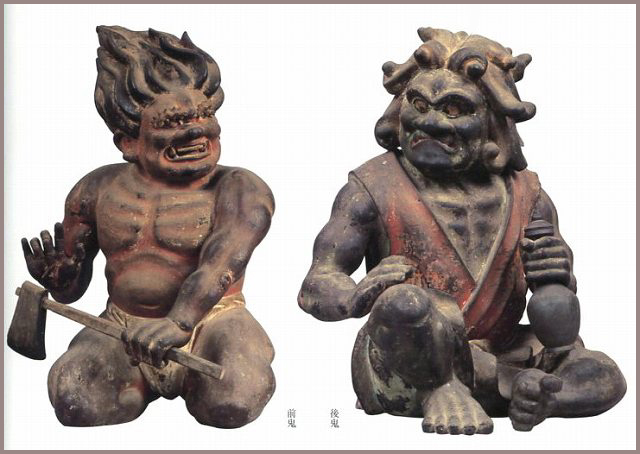 Zenki represents the positive 陽 YO aspect and is depicted as a red oni 鬼 demon holding an iron ax 鉄斧. He used to walk in front of En no Gyoja and hacked the path free. He is also depicted with a kind of straw rucksack 笈. His wife Goki was born in 奈良県吉野郡天川村 Tengawa villge in Yoshino. represents the negative 陰 IN aspect and is depicted as a blue/green demon. She holds a flask with ritual water 理水 and carries a rucksack with seeds. Together they symbolize 陰陽 the Yin and Yang of things, or the A-Un 阿吽, Alpha and Omega, the beginning and end of all things. Their five children are - - - 真義、義継、義上、義達 and 義元.
. oni no shison 鬼の子孫 / onisuji 鬼筋 - descendants of Oni . a sacred mountain in Nara, Japan, famous for its three tests of courage. it is more popularly known as Mount Ōmine due to its prominence in the Ōmine mountain range. It is located in Yoshino-Kumano National Park in the Kansai region, Honshū, Japan. located at the top of the mountain, is the headquarters of the Shugendō sect of Japanese Buddhism and the entire mountain is part of a pilgrimage and training ground for the yamabushi. 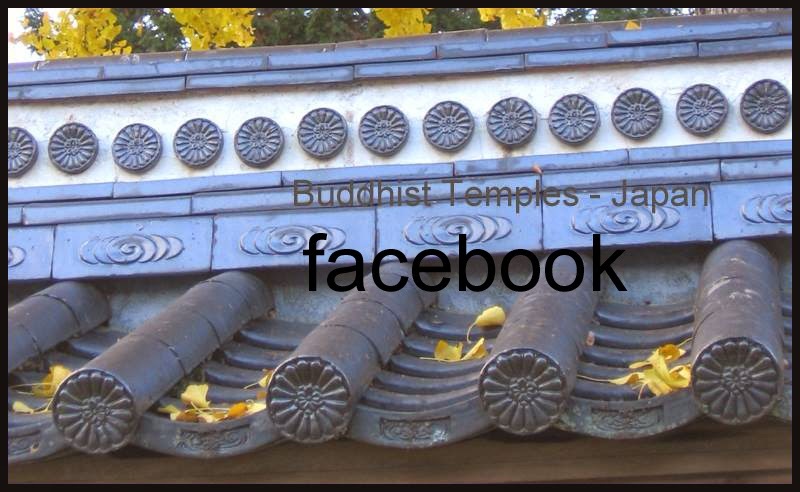 was founded in the 8th century by En no Gyōja, as a home for his new religion of Shugendō. Shugendo literally means "the path of training and testing," and is based on the self-actualization of spiritual power in experiential form through challenging and rigorous ritualistic tests of courage and devotion known as shugyo. Since 1788, a Sake brewery in Nara produces rice wine in their memory. En no Gyoja met a couple of Oni who were eating humans. He asked them not to do that any more but they did not listen to him. He hid in a cave but they wanted to give him human flesh to eat even there. Now 不動明王　Fudo Myo-O comes along and pressured the couple not to eat humans any more. Now they promised to change their ways. Zenki went to 洞川 Dorogawa (now a famous hot spring), and Goki went to 十津川 Totsukawa . 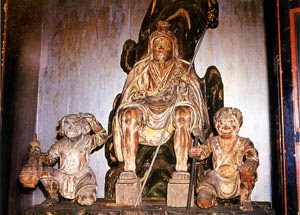 Zenki and Goki once lived on 葛城山 Mount Katsuragisan and together with the Deity 一言主神 Hitokotonushi they were strong leaders of the region.
. the Deity Hitokotonushi 一言主 . In some parts of the Omine region, the forest people are called 笈 oi : 前笈 and 後笈. oi is a kind of rucksack, made of wood or bamboo in former times. They villagers are very strong and robust and carry the luggage of visitors. They look almost like Oni and some say they are the descendants of Zenki and Goki. At 生駒山 Mount Ikomasan、En no Gyoja had a dream given to him by 孔雀明 Kujaku Myo-O. He should capture the two Oni from the foot of Ikomasan and turn them into decent beings. He stayed in prayer for 21 days and on the last day, with 不動緊縛の法 a special ritual of Fudo Myo-O he could capture them. So the Oni cut off their hair and became the pious disciples of En no Gyoja. and the village is still called that way, 鬼取 Onitori. 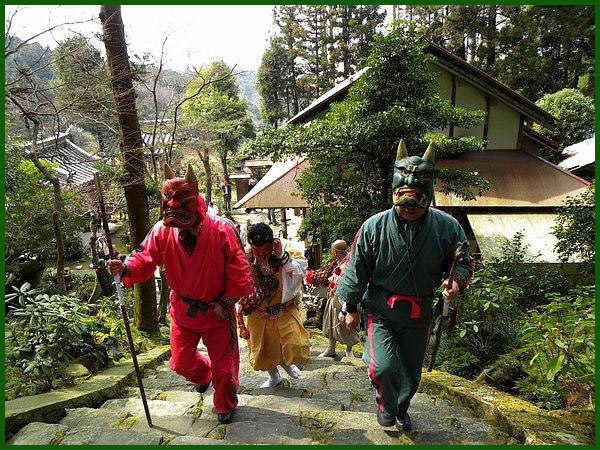 At the temple 髪切山慈光寺 Kamikiriyama, Jiko-Ji, masks of the Red and Green Oni are kept in honor and rituals are held. During the annual festival, these two masks are worn by specially elected men and lead a parade through the region. Kamikiriyama means "the mountain where they cut off their hair". When En no Gyoja practised austerities at Mount Shigisan in 673, there was a couple of huge demons of more than three meters high with long fangs. But En no Gyoja subdued them and took away their supernatural powers. They begun to take care of him and help him in his life as Zenki and Goki. At the home of the 柿阪秀元氏 Kakisaka Hidemoto family, on the eve of the Setsubun ritual in spring, they place ritual water at the entrance and prepare a special seat for the Oni to take a rest. "Fuku wa Uchi, Oni wa Uchi" May good luck come in, may the Demon come in! The family is said to have Zenki and Goki as their ancestors.
. setsubun 節分 "the seasonal divide" . oni wa soto 鬼は外（おにはそと）"Demons, get out! " . Setsubun - 「鬼は内」Oni wa Uchi ! . 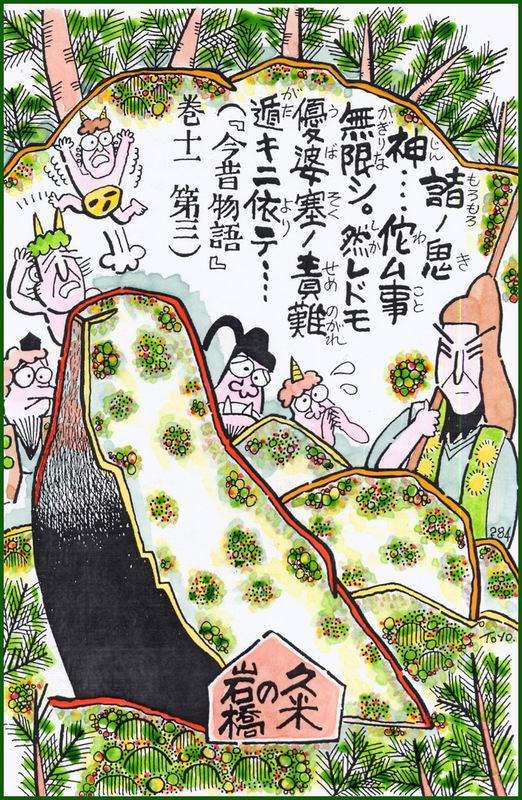 Then he tried to convince the local Shinto deity, Hitokotonushi, to help him build a 石橋 stone bridge extending from Mt. Katsuragi to Mt. Yoshino. There is also a river called 前鬼川 Zenkigawa and the Fudo Nanae waterfall 不動七重滝. was chosen as one of the 100 most beautiful waterfalls of Japan. Fed by the Zenkigawa River, water cascades down in seven stages, falling 100m from the top to the bottom and providing a majestic natural view. Early summer and fall are especially good seasons to see the picturesque beauty of the scenery. 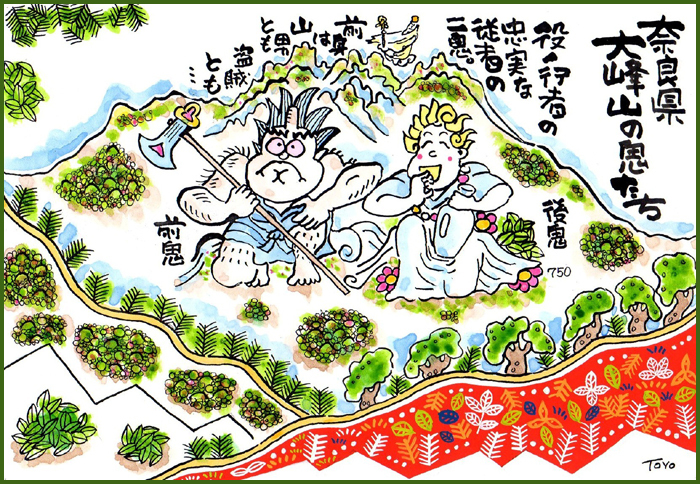 On 摂津の箕面山 mount Minosan in Settsu (Hyogo) there lived a couple of Oni. The husband had red eyes and the wife a yellow mouth. They had five children. They grabbed human children and ate them. To change their ways, En no Gyoja banned the youngest of their children in a cave. The parents came to En no Gyoja and asked him where their child was. They would never eat human children again if he would let them have the kid back. Finally he told them were it was and all of them left the region.
. 四十八天狗 - 48 famous Tengu of Japan . It is not quite clear if he is the person who founded the shrine.
. Zenkibō 前鬼坊 Zenkibo, Zenki-Bo .